Meeting Rooms are available for public use. Hershey Public Library Mission Statement: The Hershey Public Library is a community center focusing on open access to materials, programs, information, and services that fulfill the community’s educational and enrichment needs. The Library actively promotes and supports reading, literacy, information technology, and lifelong learning. • The Hershey Public Library provides meeting room space for library programs and for other meetings and programs of an informational, educational, cultural, or civic nature. The Hershey Public Library subscribes to the principles set forth in the American Library Association’s “Library Bill of Rights” as amended January 23, 1980. The library provides this space as a public service, but does not endorse the views or opinions of groups utilizing these facilities. Meetings held at the library are considered public meetings and open to all wishing to attend, subject to health and safety requirements of the Pennsylvania Department of Labor and Industry for public gatherings. Meeting Room Privileges: Organizations not fulfilling their obligations as enumerated in this list of policies and procedures may be denied use of the library’s meeting room facilities. Questions: Questions regarding policies and procedures about meeting room use may be resolved by the Library Director or Circulation Services Coordinator. The Hershey Public Library Board of Directors shall be the final authority in granting or refusing permission for the use of library facilities. Meeting Rooms: The library has a total of three meeting rooms. Two of these rooms are created by a moveable wall in the middle of the multi-purpose meeting room. Each room accommodates approximately 60 people. Room #1 has direct access to restrooms as well as a counter area with a sink. Room #2 is accessed through a hallway at the front entrance of the library. It does not have direct access to rest rooms, although there are public facilities in the building. Users wishing to accommodate larger groups of more than 60 people must request use of BOTH Meeting Rooms #1 & 2. The wall will be retracted to create a larger meeting space. The Hershey Room does not have direct access to rest rooms, although there are public facilities in the building. 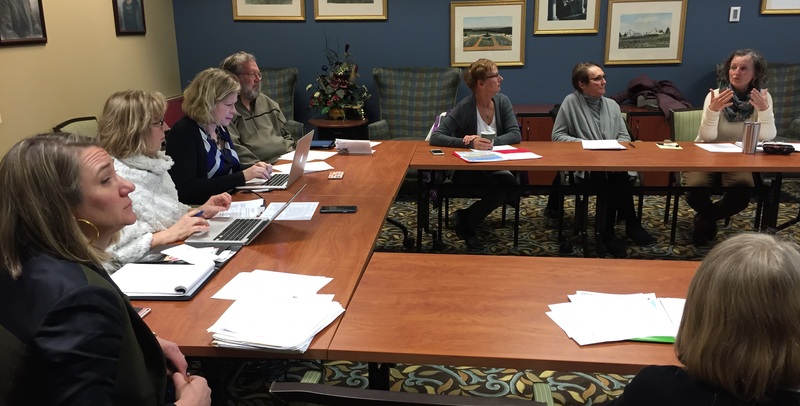 Library Programs and Meetings – which involve efforts of library staff, Library Board, Friends of the Hershey Public Library or Hershey Public Library Endowment Trust. Local Government Meetings/Programs – official meetings or programs of Derry Township, Dauphin County, or Commonwealth of Pennsylvania agencies/departments. Civic Nonprofit Groups and Organizations – engaged in educational, cultural, intellectual or charitable activities. Priority will be given to Derry Township organizations. A Derry Township organization must have 60%, or greater, of its members residing in the township. Other Nonprofit Groups or Organizations – engaged in meetings/activities that do not benefit or interest the community at large. Examples: Home Owner’s Associations Meetings, Board Meetings, Planning Committees. Activities of For- Profit – may hold classes, workshops, and meetings, excluding activities that result in direct profit, promotion, sales solicitations, or requiring a fee to attend. Only businesses located in Derry Township may use the rooms. Meeting rooms may not be used for any activity that interferes with the Library environment or its operations. Meeting rooms cannot be used for personal activities such as private parties. Scheduling: Rooms cannot be reserved without a completed application. Applications are available at the front desk or by contacting the Circulation Services Coordinator via phone or email. Applications will be prioritized and approved or disapproved according to the previously stated list of prioritized users. To allow all members of the community the opportunity to use the library’s meeting room facilities, repeated use of meeting rooms may occur on a semi-monthly basis. A group or individual that wishes to use the facilities with greater frequency, or for a number of consecutive days, shall request written permission from the Library Director or the Circulation Services Coordinator. A Fee of $40 will be charged for up to 4 hour block of time per room. This block of time includes set up time. Rental fees must accompany the application before a meeting room can be booked. The meeting room fee must be paid no less than 7 days prior to the meeting. Only volunteer-based, non-profit, community centered, civic or charitable groups may qualify for a waiver of fees. A waiver request form may be filled out and returned with the application for review by the Library Director and/or Circulation Services Coordinator and will be subject to their sole determination. The library must be informed of cancellations 5 working days before the meeting date in order to receive a refund of the deposited fee. If the library must cancel the use of a meeting room, the library staff will notify the group or individual as soon as possible. In the event of inclement weather, a meeting group’s representative should call the library for the recorded message confirming a library closing. A refund of the deposited fee will be given in such cases. Meeting Hours: The time of scheduled meetings shall correspond to the hours the library is open to the public. Users must vacate the meeting room 10 minutes before the library’s closing time. Failure to comply will result in restriction from further use of the library’s meeting rooms. Furniture Arrangement: Requested chairs and tables will be placed in the reserved meeting room. The organization/group shall handle its own room setup and furniture arrangement, as long as the furnishings are not at risk of damage. Walls may not be used for mounting or hanging pictures, displays, posters, etc. Equipment, materials, or furniture belonging to any group will not be stored in the library. The library will not assume responsibility for any items left on the premises. Audiovisual Equipment: Limited equipment, consisting of a TV/DVD player, projection screen, and digital projector is available for use. Requests for use of stated equipment must be listed specifically on the meeting room application. Equipment may not be requested the day of the meeting. Organizations or individuals are responsible for returning equipment in the condition it was received. Any damage will be charged to that organization. Other than the items listed above, users must provide their own computer, materials, refreshments or supplies needed for meetings. IT support is not available for trouble shooting when using electronic equipment. If your presentation is saved to the Cloud, please be sure you can access your account (username and password), and/or have a backup saved to a USB so you may access your presentation on any computer. Check-In/Check-out: Upon arrival, the representative of the group must contact a staff person at the Front Desk to unlock meeting room doors. When leaving, the representative must record the number of attendees in the Meeting Room Log located at the front desk along with the time and date of arrival and departure and inform a staff person the meeting is over so the room can be re-locked. Failure to record the information before departure may result in suspension of user privileges. Clean Up and Damage: The sponsoring group or individual making application for use of facilities assumes all responsibility for damage to library property and for leaving the premises in the condition in which it was found, including the arrangement of furnishings and the cleanup of trash. A minimum fee of $25.00 will be assessed for excessive cleanup. Damage to the facility will be billed to the group or individual responsible for the room and will result in restriction from further use. Smoking and Alcoholic Beverages: Use of tobacco in any form is not permitted in the library. The consumption of alcoholic beverages or drugs is not permitted in the library or on the library property. Use of tobacco in any form, smoking and E-cigarettes are not permitted in the library. Accidents: Report any accident or injuries to staff on duty immediately.